Background: In this study we surveyed over 200 healthcare leaders who hold high level management positions across institutions regarding their use and awareness of social media. Method: An online and on-site survey was used to gather information about social media use. Results: The survey found that that healthcare leaders have very little awareness of social media use in their organizations. The survey also found that they mostly use social media for personal purposes and that use is limited to two platforms, Facebook and LinkedIn. In addition, it became clear that patient engagement and research or professional collaborations through social media are not within their scope of activities. Conclusions: More education and awareness is needed in this area. Since social media is gaining presence in all areas of healthcare it is important to raise awareness to its proper use and potential. As modern society adapts to the presence of ever more social media platforms and communications and people become increasingly connected through them, the use of social media in clinical settings has expanded as well. Clinicians and healthcare professionals are seen to be using social media platforms as tools to communicate with patients, collaborate with colleagues and keep up to date on medical advancements. Earlier studies have shown that healthcare professionals often engage in social media for professional purposes [3, 13], mostly using LinkedIn and Twitter to collaborate with colleagues. Other platforms rising in popularity are Doximity and Sermo, which are designed exclusively for licensed physicians seeking to network and collaborate in a secure and HIPPA compliant professional setting. Social media platforms such as Facebook, Twitter, and LinkedIn can provide clinicians with opportunities to network, collaborate, and seek peer advice [1, 2, 5, 7, 12]. They have also allowed patients to connect with their clinicians to seek advice and more immediate responses [3, 4, 6] thus changing the dynamics of patient-doctor communications. Social media has even been used as a tool to recruit patients for clinical trials [7, 11]. These studies have shown that the use of social media is more effective in terms of recruitment because of its wide-range reach, cost effectiveness, and usability. However, this type of clinical social media proliferation presents significant challenges. Placing additional burden on providers is the nebulous delineation of appropriate boundaries between personal and professional interactions between clinicians and patients [4, 8, 10]. Providers may face repercussions from posts on personal accounts that are construed to be unprofessional or inappropriate, with consequences ranging from offending patients and colleagues to being judged by residency admissions and rejected from employment [12, 14]. Patients, too, may fall victim to a breach of HIPAA by providers’ posts revealing key identifying information without appropriate omission . Social media has also been used to disseminate medical information of poor quality or even outright fallacies, often started and perpetuated by those without verifiable credentials . However, despite these challenges there is a steady growth of healthcare professionals who are utilizing social media [1, 5], especially among the younger generation of trained professionals . Studies have shown that hospitals, clinics and organizations are joining social media not only to promote their services but also to disseminate health related information. With an increasing cohort of physicians and patients alike who use social media daily for personal reasons, it would be myopic to deny the increasing potential and innovation of social media utilization in the healthcare realm. As can be seen from these studies, social media is gaining traction within healthcare, both on the institutional and professional levels. The success and effectiveness of social media utilization within these levels very much depends on managerial leadership and support. A healthcare organization, department or individual must have clear goals and objectives for social media use as well as guidelines for such engagement. These are crucial aspects of public facing social media communications since they not only preserve its lawful use, but also ensure its positive impact on patient engagement and services. In this study we sought out to discover how social media is used by healthcare leaders. Healthcare leaders are defined as individuals who have either a clinical role, a high-level management role or both within their organization. These roles include Department Chairs, Directors and Senior Directors, Vice Presidents, Managers (C–level), partners in or owners of healthcare organizations. The rationale behind studying these populations with regards to their social media use is that these individuals, within their roles, are in a position to influence their institutional participation in social media as well as the broadcasted content. In addition, these individuals must insure their institutional and employees’ compliance with the laws governing social media use in healthcare settings and overall institutional guidelines. We believe that healthcare leaders’ understanding, utilization and overall attitude towards social media has a direct impact on its continuing role in health promotion and communications. Therefore, we focused our study on individuals in the above positions in an effort to better understand how they lead both their personal and institutional activities in the social media arena. This study is based on the results of a survey that was sent to individuals who were either current or former students of the “Healthcare Leadership Delivery” Master’s program at The Icahn School of Medicine at Mount Sinai or potential candidates who expressed interest in the degree. This Master’s degree is geared towards healthcare executives and thus targets very specific individuals that hold such positions within healthcare organizations. This is a relatively new program which is now in its 3rd year of operations. The survey was distributed in paper during orientation to the new incoming cohorts for the past 2 years and sent online to interested individuals via email. The survey was distributed to 283 individuals in total. The relatively small population to which the survey was sent is a result of the program and its focus on managerial and clinical individuals. A total of 42 individuals answered the survey in paper format. These results were manually entered into SurveyMonkey in order to be able and analyze the responses while a total of 101 individuals answered the survey online, directly through SurveyMonkey web-link. Overall 143 individuals answered the survey. 94 participants answered all questions while 49 answered the survey partially. The survey was comprised of 12 questions and included both demographic questions such as gender and age group as well as professional questions including, degrees, roles and medical specialties (see Appendix A for the full survey). The following is a description of the 143 survey participants. 79 females and 63 male participants were identified. The majority of participants were between the ages of 40–59 (see Table 1). Distribution of participants by age groups. 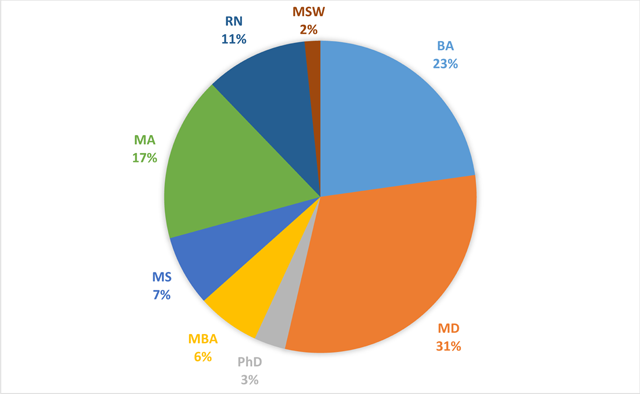 The majority of participants were physicians (MD) followed by BA (bachelor degree), Masters of Arts degree (MA), Masters of Science (MS) and Registered Nurses (RN) (see Figure 1). Other degrees identified were Masters of Social Work (MSW), Masters of Business Administration (MBA) and PhD. We asked participants to define their roles. Since the focus of the survey was to examine how healthcare leaders use social media, their roles within their organization is an indicator of their leadership levels. As can be seen in Table 2, many of the participants were C-level managers. These individuals are defined as high-level executives who, in most cases, have the title “chief” in their organizational titles. In addition, many of the participants were identified as either Individual Contributors or Directors, Individual contributors include persons who function mostly as external consultants to healthcare organizations while directors manage a department or a team within an organization. Finally, we asked participants to identify their medical specialty in order to be able and examine whether or not there are differences in social media use between them. Approximately 50 different medical specialties were listed by participants. Table 3 lists the top ones. Top medical specialties listed by participants. We asked participants to select one or more social networking sites that they use either for professional or personal purpose. As can be seen from Table 4, we listed a variety of such sites ranging from those that can be used either for professional or personal purposes such as Facebook or Twitter to purely professional social networking sites such as LinkedIn, Mendeley, ResearchGate and others. Of the 143 respondents, 121 reported using social networking sites of some sort, personally and/or professionally. Five of the 22 who reported not using social networking sites were director-level health care leaders. Half of those who reported not using social networking sites indicated “other” jobs, including physicians, case managers, and nurses. Of the 121 respondents who indicated using social networking sites, 117 reported which social networking sites they have accounts with. The vast majority of the respondents (102, or 87%) reported having accounts with LinkedIn, indicating a preponderance of use of social media for professional reasons. The next most used site was Facebook with 92, or 77% of respondents. A little less than half of total respondents reported having accounts with Twitter and/or YouTube. A minority of respondents had accounts with science/medicine-oriented professional networking sites like ResearchGate, ORCID, and Sermo. The 2 “other” responses included private sector’s professional networking sites. Unsurprisingly, LinkedIn and Facebook were uniformly the most used sites among the different cohorts of the healthcare leadership program. In addition, we asked participants to indicate how many times per day they are likely to use social media. The same 117 respondents who reported having accounts with social networking sites reported how much time they spent on those sites. The most common amount of use was less than 1 hour, reported by 50 respondents, or 43%. 19% of responders reported using social media less than an hour on a daily basis. Only 9% of responders reported use for more than 3 hours a day; the majority of this group came from those who individually self-identified themselves using the “other” option in the survey. These included case managers, nurses and physicians. The survey also included a question regarding their motivation for using social media. A total of 117 participants answered this question. The results show that healthcare leaders use social media more for personal reasons than for any other reason. As was seen in the previous section, the most popular two social media sites are Facebook and LinkedIn. The results in the table below further demonstrates that people use Facebook and LinkedIn for a wide variety of purposes, whereas other social media in comparison have a narrower scope of use. People largely use Facebook, Snapchat, Twitter, and Youtube for personal reasons, while using LinkedIn for personal professional promotion. The most popular professional social media platform is LinkedIn with 100 users with 69% of them using LinkedIn for professional promotion, 60% – for networking, 24% – for personal reasons, and 24% use it for education. Facebook is the second most popular platform with 93 users, with 92% of participants using it for personal reasons, 23% for networking, 10% for education, 8.6% for professional promotion, and 7.5% for patient engagement. YouTube is third most popular with 67 users, of which 72% use YouTube for personal reasons and 39% use it for educational purposes. Twitter comes in fourth with 49 users, of which 61% use it for personal reasons, 29% for professional development, 26% for networking, and 16% for educational purposes. Doximity, Figure 1, ORCID, Mendeley, ResearchGate, and Snapchat each received fewer than 30 responses, so they are substantially less influential. It is surprising that less than 12% of people used social media for the purposes of institutional/departmental promotion and for patient engagement, indicating areas for future improvement and better utilization of social media (see Table 5). Purpose of social media use. Sharing content on social media is an important aspect of the overall engagement with such channels. By asking participants to indicate how they share content we aimed to see whether healthcare leaders share professional content with patients or colleagues. We asked healthcare leaders to respond to how often they share their own content on social media versus sharing external content from other media sources or from their institution. Of the 108 survey respondents, 41.7% say they never/rarely ever post their own content (0–10% of time) whereas 18.5% almost always post their own content (80–100% of time). Interestingly, people who are under 40 years old tend to post their own content more frequently, with 11/23 or almost half of them saying they share own content over 40% of the time compared to 26/83 or less than one third for the group over 40 years old. Of the 100 people who responded to sharing external content from other media sources, there is a more even distribution of how frequently they share, with 39% of people saying they never/rarely share external content (0–10% of the time), 44% of people sharing external content sometimes (10–60% of the time), and 17% of people saying that they share external content 60–100% of the time. Finally, 64% of people say that they never/rarely share external content from their institution (0–10% of the time), and another 27% of people say they will share content from their institution 10–40% of the time (see Table 6). This is an area that can be further elucidated, since institutions are highly variable in their social media culture and goal of being recognized by the public. Content sharing on social media. Following previous answers regarding content sharing, we asked participants to indicate how often does their organization use social media. This question was designed to reveal the level of awareness participants have of social media engagement by their own institutions. As can be seen from Table 7, only 80 participants indicated whether or not they are aware of their organization uses social media or not. Directors, individual contributors C-level managers were the most aware of the fact that their organizations use social media across various frequencies. Organizational use of social media. From the data we see that 54 participants indicated that their organizations use social media in frequencies varying from extremely often (several times a day) to slightly often (several times a month). Eight participants indicated that their organizations do not use social media and 18 did not know or were unsure whether or not social media is used. This does not mean that these organizations do not use social media but rather an indication of awareness levels. It is surprising that C-level managers were not aware or were unsure whether or not their organizations use social media. Based on these answers we also asked as to level of awareness to social media activities on department level. Department use of social media implies that social media is well adopted in organizations to a level were individual department maintain these channels and communicate content that focuses on the department itself rather than the organization as a whole. As can be seen from Table 8, that only 54 participants indicated that their department uses social media to some degree. Department use of social media. Participants in the survey were candidates and current students in the Masters of Healthcare Leadership Delivery program at Icahn School of Medicine at Mount Sinai. The participants were managers in a variety of levels across healthcare organizations such as hospitals, clinics and private companies. The main reason we targeted this group is their ability to professionally influence communications channels and methods used by departments and institutions. Such communications can vary from patients’ targeted messaging, promotion and/or advertising of health related services to professional collaboration and knowledge sharing. The participants’ attitudes towards and awareness of social media’s role in such communications is crucial for their successful deployment and continuous use. Social media channels vary in form and purpose. Some are designated as professional channels and include platforms such as LinkedIn, Doximity and Sermo. Some, are social in nature and evolved into marketing and promotional vehicles. These include Facebook, Twitter, Instagram and others. Finally, there are social platforms which are designated for research and collaboration such as Mendeley, ResearchGate and others which are also used for scientific collaboration and sharing across disciplines. In order to examine the degree to which participants are partaking and/or are aware of the different types of platforms and purposes we included them in the survey while also allowing them to add additional platforms that might be known to them. The results show that most participants know and use two main social networks, Facebook and LinkedIn. Facebook is mostly used for personal purposes while LinkedIn is used for professional development and networking. Those who use social networks such as Twitter and Instagram do so mainly for personal purposes as well. Most of the respondents do not spend much time interacting on these channels on a daily basis quoting less than an hour per day. Therefore, it is not surprising that patients’ engagement, health related promotions and institutional marketing are not mentioned as part of their activities on social media. The participants also rarely use research and scientific collaboration channels. This might be because the participants are mostly clinicians or have clinical focused jobs and are not researching or publishing often. However, there seems to be also lack of awareness of such platforms. It was surprising to find that healthcare leaders are not very much aware of social media activities within their organization and/or department. It is unknown why such awareness does not exist since marketing departments do use social media for advertising health related services. This could be a result of lack of interest or lack of time since most participants hold both administrative and clinical roles within their organizations. Another significant finding from the survey was that less than 12% of healthcare leaders surveyed used social media for institutional/departmental promotion and for patient engagement. This could be due to a number of reasons, such as healthcare leaders’ fear of overstepping boundaries given a lack of guidelines for social media use, a lack of awareness and/or willingness to try newer social media sites, or simply a biased sample of survey respondents whose institutions do not have the culture of using social media and technology for promotion. 64% of people say that they never/rarely share external content from their institution (0–10% of the time), which also indicates a gap of knowledge in how social media can be successfully used to promote healthcare institutions to the public. The vast majority of healthcare leaders have not entertained the concept or adopted the use of social media as a means to promote their institutions and improve patient engagement, but they should invest time in learning how to use these incredibly valuable resources. Whether as a personal communication tool or as sources of information, social media has crossed age, professional and geographical barriers. These channels can serve as efficient tools for clinicians and healthcare leaders to communicate with patients especially in areas of population health. Younger generation of clinicians that are already using social media will probably be more engaged with these channels as ways to communicate with both patients and colleagues. Therefore, institutional endorsement, support and guidelines are crucial for such communications to be effective and compliant. Healthcare leaders who are in position of management will need to take active part in these efforts in order to ensure their standardization across clinical functions. The prevalence of social media use by all age groups is an opportunity for these healthcare leaders especially in areas of health promotion, collaboration and education. Awareness and usage of social media channels by healthcare leaders is a crucial factor in their successful deployment. The limited use and lack of awareness shown in this survey responses needs to be addressed so that healthcare managers can engage more effectively with both employees and patients. It is unclear whether the limited use of social media as seen here is lack of awareness, resistance or lack of time. However, it is clear that it is very much limited to two main platforms one of which is Facebook which is used for personal purposes and the second LinkedIn which is used for professional purposes. The gap that we see here is mostly in patient and population engagement, healthcare services promotion and clinical and/or research collaboration. This can improve by creating more awareness and educational training demonstrating the value of social media engagement for different purposes. Clark A and O’Glasser A. Vox Popularis: Social Media and Medicine. Intern Med. 2016; 176(3): 340–9. Courtney KL and others. The use of social media in healthcare: Organizational, clinical, and patient perspectives. Enabling Health and Healthcare Through ICT: Available, Tailored and Closer. 2013; 183: 244. Klee D, Covey C and Zhong L. Social media beliefs and usage among family medicine residents and practicing family physicians. Family Medicine. 2015; 47(3): 222–226. Ventola CL. Social media and health care professionals: Benefits, risks, and best practices. Pharmacy and Therapeutics. 2014; 39(7): 491.